Bill Jacobs BMW of Naperville is proud to announce the results of their month long breast cancer awareness campaign that took place during October. Breast Cancer is a disease that has touched the Bill Jacobs BMW family, and we are proud to have had such a successful campaign last month to raise awareness about the disease. Bill Jacobs BMW of Naperville is proud to announce the results of their month long breast cancer awareness campaign that took place during October. 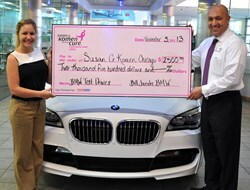 By donating $1 per test drive taken in October and $25 for each new BMW vehicle sold throughout the month, the dealership made a generous donation of $2500 to Susan G. Komen Chicagoland. “Breast Cancer is a disease that has touched the Bill Jacobs BMW family, and we are proud to have had such a successful campaign last month to raise awareness about the disease. We support breast cancer survivors all year long," said Greg Joutras, General Manager at Bill Jacobs BMW. Bill Jacobs BMW’s General Sales Manager, Rick Ayash, presented a $2500 check to Hilary Grunewald, the Development Coordinator for Susan G. Komen Chicagoland. In addition to the funds raised and presented to Susan G. Komen Chicagoland Foundation, Bill Jacobs BMW also embodied the full pink ribbon spirit during the month of October, by handing out long stem pink roses to all visitors at the dealership, and printing repair orders on pink paper. All employees at the dealership also sported pink ribbons to support the cause through the duration of October. Susan G. Komen fought breast cancer with her heart, body and soul. Throughout her diagnosis, treatments, and endless days in the hospital, she spent her time thinking of ways to make life better for other women battling breast cancer instead of worrying about her own situation. Moved by Susan’s compassion for others and commitment to making a difference, Nancy G. Brinker promised her sister that she would do everything in her power to end breast cancer. The Chicagoland Affiliate of Susan G. Komen was established in 1997 and held the first Susan G. Komen Chicago Race for the Cure®. With the support of their signature fundraiser, the Komen Chicago Race for the Cure®, the Komen Chicagoland Affiliate has awarded over $12 million towards the fight against breast cancer. As one of the largest BMW dealerships in the Chicago-land area Bill Jacobs BMW is fully committed to creating a shopping experience for their customers that matches the luxury products they represent. In keeping with the Bill Jacobs tradition, they promise to provide a customer-friendly purchasing experience, as well as a responsive and reliable experience in their service department. With over 50 years in the automotive business, Bill Jacobs BMW is a name you can trust. For additional information, visit Bill Jacobs BMW at 2495 Aurora Avenue, Naperville, IL 60540 or by calling (866) 516-8010. Visit Bill Jacobs BMW online at http://www.billjacobsbmw.com/index.htm.